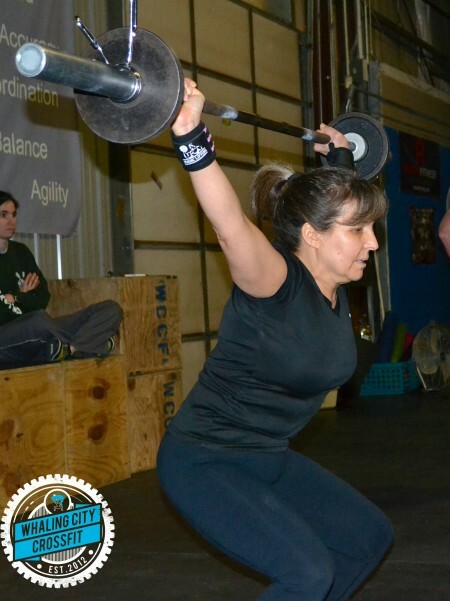 Connie During Open Workout 15.2! The End of the CrossFit Games Open!! Friday Night Lights and After Party! 15.5 gets announced Thursday night at 8pm! So this FRIDAY night, we’re going to THROWDOWN and then CELEBRATE the END OF THE OPEN! Heats for 15.5 will start at 5:30pm. We will be providing food and beverages for all spectators and athletes that are throwing down! Please RSVP by Wednesday if you will be attending (and any guests are more than welcome!). RSVP in the gym or the Facebook Event page. 1. Weighted Pull-ups 5×5 – scale as needed. 1a. 4×6 BTN Strict Press, AHAP – rest 90 sec. 1b. 4X10-15 C2B Pullups – complete in unbroken sets if possible, if you have more than 15 reps UB do not do more – rest 90 sec.